London, UK - March 3, 2019 /MarketersMedia/ — Michael Lombard an international fashion designer, specializing in premium leather, stuns the world during London Fashion Week (LFW) by partnering with Monster Energy Drink to present his World War “M” Collection, powered by The House of iKons. Michael Lombard is the first designer to partner with Monster Energy Drink. Michael Lombard represents the Java Coffee flavor of the Monster Energy Drink. 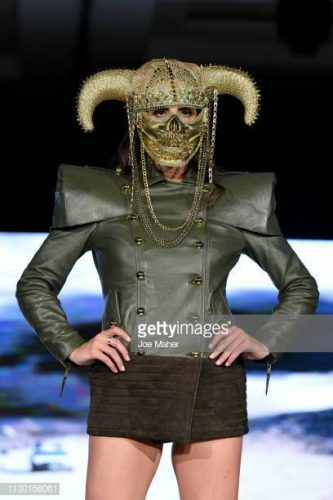 Saturday, Feburary 16, 2019, Michael Lombard was the grand opening for LFW, showcasing his Mad Max inspired Spring 2019 collection. His collection features premium leather, and edgy unique pieces such as gas masks and Roman helmets. He uses high-end Sheepskin and Calfskin Leather for his designs, which makes for only the best in creation. The theme for the night was War and the color scheme consisted of army green, light gray and black. Approximately 28 models strutted down the runway in the Michael Lombards Spring 2019 Collection with the Monster Energy Drink logo displayed above, while Marylin Manson and the like played in the background to enhance the fashion experience. “This is the craziest and best shows I’ve seen by fa,” said one person in the crowd. Michael Lombard uses his knowledge in music and his love for fashion and combines them into not just a fashion show but an entertaining theatrical event. As if Michael Lombard doesn’t amaze enough, he also works with International Fashion Weeks Amsterdam, NYFW and LAFW among many others he does around the U.S. The Society Fashion Week and International Fashion Week and is COO of the World Fashion Council. Staying busy and continuously being published and recognized is the norm for Michael Lombard, so teaming up with Monster Energy Drink is a milestone because it has not been done, by any fashion designer. Michael Lombard dubbed, “The King of Leather Jackets” by the Huffington Post, has big plans for the Michael Lombard brand. The collaboration with Monster Energy drink is definitely one of them and a huge accomplishment for the designer to get his brand out there. Michael Lombard has graced the runways of LFW, Amsterdam Fashion Week and many more. Look out for his cutting edge designs worldwide. More information about the Monster Energy Drink brand can be found at www.monsterenergy.com. Information about The House of iKons and other fashion shows Michael Lombard participates in, can be found at www.houseofikons.com and International Fashion Weeks at their facebook page IFW – International Fashion Weeks www.thesocietyfashionweek.com and International Fashion Weeks at their Facebook page IFW – International Fashion Week. Once an executive music producer, now a fashion designer, Michael Lombard gets his inspiration from music and his surroundings. Michael says he uses leather to be different from the rest. Everything has to be “top-notch”. His collection is featured in fashion shows and boutiques worldwide and is also available online at www.michaellombard.com. Michael Lombard’s mission is to create luxury leather unmatched in the fashion industry.